In 2005, a mother who had just given birth received codeine to dull the pain associated with childbirth. In her body, the codeine was converted into morphine by a drug-metabolizing enzyme called CYP2D6. Although people carry many variations in the gene for this enzyme, this woman had an unusual difference: she expressed multiple copies of the gene. As a result, the additional CYP2D6 enzymes in her body churned through the codeine so efficiently that her morphine levels spiked and stayed high. Unbeknownst to her doctors, high doses of the drug had passed from her milk into her infant. When the baby was brought back to the hospital with gray skin 12 days after his birth, doctors were puzzled. He was an otherwise healthy baby boy. The next day he died—the concentration of morphine in his blood 30 times higher than expected. 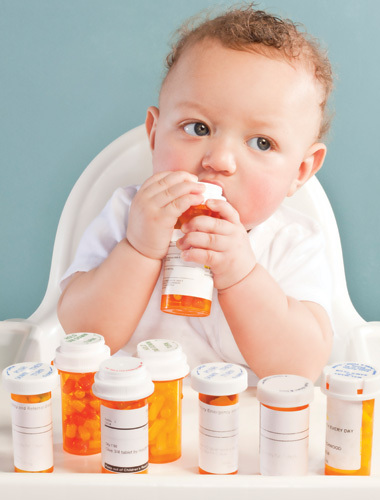 The case highlights not only how variable adults can be in how they metabolize drugs, but also how challenging it is to correctly diagnose and treat infants, whose symptoms and basic physiology differ greatly from those of grown-ups. When babies get sick, they can’t say what’s wrong, what hurts, or whether a treatment has helped. Their most vehement expression—crying—doesn’t always convey whether they are in pain, scared, or simply hungry. What’s most confounding is that the drugs intended to treat their pain react much differently in their small bodies than in those of adults, in some cases rapidly accumulating to high concentrations, in other cases clearing out of their bodies much faster. On top of that, their developmental changes aren’t always linear; sometimes the function of a particular pathway fluctuates throughout childhood before stabilizing at adult levels, making it difficult for doctors to be sure they are getting the dosing right. A dearth of knowledge about how a child’s physiology changes from birth to adolescence, together with the understudied effects of many drugs in their bodies, makes almost any treatment risky. And yet in the past several years, researchers have begun to tease out how this changing physiology affects a drug’s pharmaco-kinetics: how the drug is absorbed into the bloodstream, how the drug distributes throughout the tissues, and how the drug is metabolized and removed from the body. Morphine, for example, can be safely given to children following surgery or other physical trauma, as long as certain considerations are taken into account. 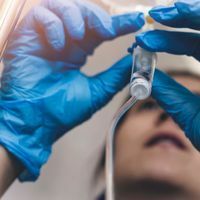 “Kids are more watery than adults, and adults are fatter,” says Wick Kraemer, a pediatric anesthesiologist at Children’s Hospital of Philadelphia (CHOP). This makes a difference in the metabolism of drugs, such as morphine, that are hydrophilic, or water-loving, allowing them to circulate throughout a baby’s “watery” body more effectively. As a result, morphine will be eliminated from a baby’s body more slowly than from an adult’s, and thus should be readministered less frequently. But as a baby ages, its bodily water percentage also changes, in turn affecting the time it takes for half of the dose to be eliminated. 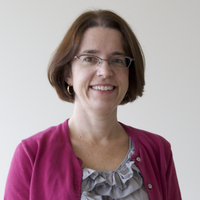 In premature babies, who are typically 85 percent water, the half-life of morphine is 6 to 9 hours; in normal-weight newborns, who are usually 75 percent water, it’s 7 to 8 hours, and in a 6-month old, 3 to 5 hours, says Kraemer. (By comparison, the adult body is about 65 percent water.) But drugs, such as the pain medication fentanyl, that use fat as a vehicle, do not distribute well in the body of a newborn, which can have as little as 1 to 15 percent total body fat. While much is yet unknown, here are some of the physiological differences between children and adults that make treating kids so difficult. A child’s brain has more neuronal connections than it knows what to do with. About 50 percent of neurons in a child’s brain do not make it to adulthood. Both cell death and pruning—in which neuronal branches that extend into inappropriate areas are degraded—are responsible for eliminating the irrelevant connections to allow stronger ones to form. Some researchers think that unpruned connections may contribute to the high incidence of seizures in children. Indeed, with seizures affecting at least 1 to 4 out of 1,000 neonates in North America, antiepileptics are one of the most common drugs given to children. Although there is general agreement that seizures can impair normal brain development, there is no good clinical consensus as to how they should be managed and treated. Even defining them in the first place is problematic, as some seizures do not result in convulsions. Until then, many pediatricians opt for newer antiepileptic drugs, which, although they are considered off-label for children, appear more effective with fewer side effects, according to anecdotal evidence. However, drug trials confirming the pharmacokinetics of these drugs, and their effectiveness in children of different ages, have yet to be performed. The acidity of a newborn’s stomach fluctuates after birth and doesn’t reach adult levels until about 2 years of age. In utero, an infant’s stomach has a pH of 7, or neutral. But within 24 to 48 hours after birth that number drops to between 1 and 3, an acidity similar to that of an adult’s stomach. After another week, however, it returns to near neutral until the child is about 2 years old. Differences in stomach pH readily alter the stability of a drug and also change its ionization, which in turn affects how well it is absorbed into the blood. Neutral stomach pH alters how acid-labile drugs—or those which are sensitive to acidic environments—behave. Examples include antibiotics such as penicillin, erythromycin, and amoxicillin. Adult doses are adequately adjusted to account for the percentage of the dose that is destroyed in the stomach. But in an infant’s or toddler’s stomach, much less of the drug is destroyed, resulting in a potentially higher dose than intended. These pH-sensitive drugs, therefore, must be adjusted for infants, not just because of their body weight but also because of their stomach pH. On the other hand, drugs that are weak acids, such as the seizure medication phenobarbital, may require higher doses for young children because in a neutral environment acidic drugs become ionized, which decreases the amount that can be absorbed into the blood and tissues. In addition to pH changes in the gut that affect drug dose, the underdeveloped muscle action of the stomach can also change how drugs are shuttled through the body. The contents of a newborn’s stomach are slow to empty into the intestines, explaining the gastric reflux that babies commonly experience. Since most drugs are absorbed much more efficiently in the intestine, where the high surface area of the villi facilitates drug passage into the bloodstream, the delay in gastric emptying in infants delays the time it takes for a drug to get into the blood and exert its therapeutic action. It’s not until a child is 6 to 8 months old that stomach emptying is fully mature. Despite these confounding factors, most drugs are given to children orally—either because no intravenous formulation exists, or because intravenous and subdermal injections come with their own risks. Like most of a newborn’s organs, the kidneys are not fully developed at birth. 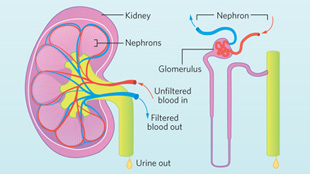 The kidney’s main unit of filtration, the glomerulus—an encapsulated radiator grate of blood vessels that release toxins and fluid from the blood into the bladder—isn’t fully mature for many weeks after birth. A full-term newborn has a glomerular filtration rate as low as 2 to 10 mL/min per 1.73 m2 of body surface area. This rate more than doubles within the first week after birth. And by the third week, it is at 50 to 60 percent of the adult rate of around 100 mL/min per 1.73 m2, which is fully attained by age 1 to 2. The liver is an organ that undergoes a sort of metamorphosis at the time of birth. In utero the liver doesn’t play its usual role in digestion—building or degrading proteins, producing bile—because all of the fetus’s nutrients come directly via the placenta. Instead, the fetal liver’s main function is to produce blood cells. Just before birth, changes in gene expression begin to prepare liver cells for their role as toxin metabolizers and filters, and the stem cells responsible for producing blood migrate to the bone marrow. The liver is the site where most drug metabolism occurs, even though drug-metabolizing enzymes are expressed in other tissues throughout the body. The most important metabolizing enzymes belong to a large family called cytochrome P450 (CYP), which contains nearly 12,000 members across all forms of life and is encoded by 57 human genes. This class of enzymes is estimated to metabolize more than 85 percent of the drugs on the market. While their contribution to drug metabolism is well understood, researchers are just beginning to realize that genetic differences affecting the function of these enzymes can account for the wide variability in drug response among patients of all ages, adding yet another caveat for pediatricians to consider. At birth, CYP enzymes function at about 30 percent of adult values. But their levels do not increase linearly with age; rather, they can fluctuate. The expression of CYP3A7, which is the most common enzyme in the fetal liver, increases after birth, then drops to undetectable levels shortly thereafter. After the first week of life, CYP3A7 is replaced by CYP3A4, one of the most important CYPs, and responsible for the metabolism of about 50 percent of drugs currently on the market. Some CYPs take even longer to appear. CYP1A2, responsible for metabolizing caffeine, the asthma drug theophylline, and olanzapine, an antipsychotic drug used to treat autism, doesn’t appear until between 1 and 3 months of age, greatly altering how long the drugs stay active in very young infants. But the ontogeny, or the sequential appearance and activity of these enzymes, isn’t the only consideration. As the enzyme responsible for metabolizing over-the-counter cold medications, as well as converting codeine into morphine, CYP2D6 has more than 75 known genetic variants in the population. Different combinations of mutations, gene duplications, deletions, or rearrangements account for the four phenotypes that are observed with this enzyme: poor, intermediate, extensive, and ultrarapid metabolizers. And the phenotypes are present at varying levels in populations around the world. For example, the ultrarapid CYP2D6 phenotype is present in nearly 30 percent of the population in Ethiopia, though only at 10 percent in Greece and Portugal. In addition, CYPs aren’t the only relevant metabolizing enzymes. The drug theophylline, which is given to adults and children for breathing difficulty and asthma, has a half-life of about 9 hours in the adult. In the premature infant, theophylline’s half-life increases to as much as 50 hours, and the drug is metabolized by methylation into caffeine. In adults, however, the drug is oxidized and demethylated, and does not produce caffeine as a metabolite. The immune system is an ever-learning, ever-adapting collection of cells, cytokines, and other protective factors. Its hallmark diversity develops over time. While many cells of the immune system are already present in a newborn, few are fully functional. 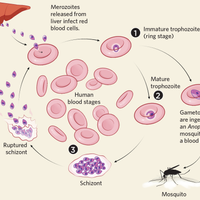 During the first 10 years of life, the immune system builds its repertoire of foreign-molecule-recognizing receptors and fashions an arsenal of memory cells, which have fought infection once and will respond much faster on their second encounter with a particular pathogen. However, the development of a full complement of defenses requires time and exposure to a diverse array of particles and pathogens from the environment. In newborns, B cells have not begun to produce protective antibodies, and much of the protection a child is born with comes from maternal immunoglobulin G (IgG) received in utero through the placenta and afterward through the mother’s breast milk, which is infused with her IgG antibodies. This passive protection serves the child well, yet when very young children do get a bacterial or viral infection, they are much less able to control that infection, potentially leading to a number of complications, including seizures, uncontrolled whole-body infection called sepsis, and even death. Because their immune system lags in readiness to face pathogenic threats, children are given immunizations early to help spur their cells into developing protective responses against some of the most common and dangerous childhood diseases. Vaccines can sometimes cause a child discomfort and fever, which parents may want to treat with a dose of children’s Tylenol. But a 2009 study showed that giving drugs such as ibuprofen (Advil) or acetaminophen (Tylenol) following vaccination can decrease the effectiveness of vaccines by as much as 50 percent. These common drugs are designed to dampen inflammation, and that hampers the immune activation that is critical to the production of protective antibodies. The study’s authors recommended that parents refrain from giving children fever-reducing pain relievers after their vaccinations. While the developmental changes outlined above might suggest that much is known about young children’s physiological uniqueness, the relative contributions of the lungs, liver, stomach, and kidneys to drug metabolism have not been clearly defined for the majority of drugs used in children and neonates. In addition, complex interactions between these systems can throw a wrench into the pharmacokinetic formulas that have been worked out for a child at a certain age. Just as anti-inflammatory drugs can alter the effectiveness of vaccines, inflammation in general may also change the expression of drug-metabolizing enzymes. Some evidence has shown that inflammation may decrease the expression of certain CYPs in adults. Is the same true in children? The data are not yet conclusive. “In the absence of good clinical-trial data, people will use the medicines on hand to help children. Sometimes it’s helpful, and sometimes it’s not,” says Bob Shaddy, chief of cardiology at CHOP. 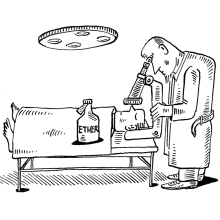 But ethical issues abound when trying to develop safe and informative clinical trials. As a result, childhood physiology is still a relative black box, and doctors do their best with a shortage of information. Yet researchers are beginning to call for better regulations to encourage clinical trials that are not just specific to the pediatric population, age zero to 17, but also specific to developmental stages. Although such trials would be more expensive, says Choonara, they are the only way to truly be able to treat this population based on data rather than anecdote.